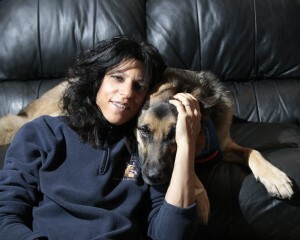 Just to give you a little background on whom we are at Canine Case Squad and where we evolved. 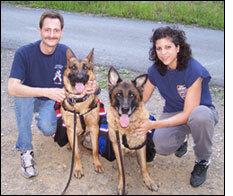 We began our training education in 1990 studying and getting certified by the Animal Behavior Center of New York. We are both Board Certified Companion Animal Behavior Counselors and certified trainers and over the last 23 years we have worked with all breeds of dogs. We were formally educated in the field of applied canine behavior and companion animal behavior analysis and counseling. Currently Daniel and Shari are members of the Association of Companion Animal Behavior Counselors, ISAE, APDT & IWDBA. 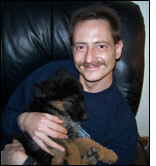 Daniel was on the faculty at ACAS where he taught undergraduate and graduate classes in applied canine behavior. Both Daniel & Shari have been published and have had the honor of lecturing to trainers and behaviorists at the ABCNY School as well as at a number of seminars and consult with specialized law enforcement and military units. 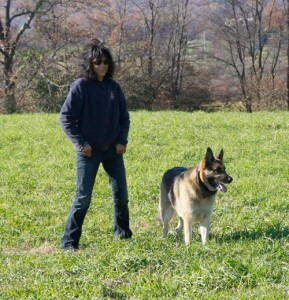 When we first started in the field we had focused on traditional training teaching on and off leash obedience, tracking, agility and attack work. As we continued our work in the field we came to realize that traditional training didn’t focus enough on canine behaviorism or solutions to behavior related problems. Once we came to this conclusion we started studying canine behavior and our education started in earnest. While to this day we do believe in training; and offer it to our clients, the study of applied canine behavior opened a whole new world to us as canine professionals. By studying wolf packs and their behavior, as well as being lucky enough to have had great teachers of this within our own dogs and the professionals that taught us, we formed our own approach to dogs and their owners. We are often asked what the difference is between Training and Behaviorism. Training opens communication between owner and dog, allows the dog to understand what an owner wants him or her to do. This is usually in the form of sit, stay, come, down, heel and more advanced commands as the dog progresses. Behaviorism looks at why a dog does things and figures out how to resolve the issues. This is usually seen in destructive behavior, aggression, ‘the bad dog syndrome’ and real behavioral disorders. The behaviorist looks into the canine mind to figure out how the dog thinks and lets owners understand why the behavior is occurring and then comes up with a modification plan to correct it. Unlike trainers, we identify the underlying cause of the problem, utilize behavior analysis techniques to solve the issue permanently preventing it from re-occurring or manifesting into other areas. Addressing the underlying cause is essential or like a tube of toothpaste, if you simply close the cap but leave a hole, the past will squeeze out in many areas. Many people that we deal with do not understand that regardless of the size of their canine companion the dogs mind is still that of its hereditary ancestor the wolf, something scientists have now proven through DNA evidence. There is no getting around the fact that they look at the world from this pack mentality. While in today’s age it is more accepted by owners that dogs base their lives on this pack mentality, most owners still don’t know what that means. Over and over we hear people say, he doesn’t know he is a dog or he is more my child then my pet. While we ourselves treat our dogs as members of our family it is only fair that we try understanding what they are thinking and how our actions affect them. Quite often a well meaning, loving dog owner will find themselves in the situation that their dog is ‘acting up’ or they will tell us he is good 90% of the time but during this.. Or when this happens he just has problems. When we come into someone’s home and start observing what is going on and how the family is interacting with the dog the problem jumps out at us. While we patiently explain what is transpiring from the dog’s point of view you can see clarity coming into the owner’s eyes for the first time. Quite often an owner will shout out with amazement, “Oh my, I never thought of that, so that’s why he does that”. In today’s advanced age many owners know words like pack leadership and alpha dog or they watch TV shows, read the internet; but they don’t truly understand what they are doing wrong or why they cannot help their dogs. Our goal is to educate both owners and their dogs in order for both to live a happy life together. Many dogs live their lives nervous and ‘stressed out’ due to lack of understanding on their owners part, this also causes the owners to live with problems ranging from mild and annoying to severe and dangerous situations; all out of a simple lack of understanding. By evaluating the situation we give the owners the knowledge to change the dynamic around causing a happy environment for the dogs and the household. During more severe cases we will often consult with your veterinarian regarding pharmaceutical intervention on either a short term or long term basis. Some behavior problems are the result of physical / medical problems and others the result of long term associations, often resulting in innate responses. We have extensively studied these areas, including psychopharmacology, allowing us to best help you and your dog. We specialize in aggression and phobia’s, understanding the cause of these behaviors and more importantly, how to resolve them. Additionally, we consult with many veterinarian’s, behavior specialist and evaluate / assist dogs involved in court cases after a bite incident. Please feel free to contact us with any questions regarding our background, training and behavior methods; as well as any assistance we can provide you for your clients experiencing behavioral disorders or routine problems.